It is a renowned historical temple of Goddess Mahakali popularly known as Bawe-Wali Mata. The fort overlooks the river Tawi flowing placidly down the Jammu City. The complex is housing 76 government offices and courts. The complex has a history as old as 150 years back. 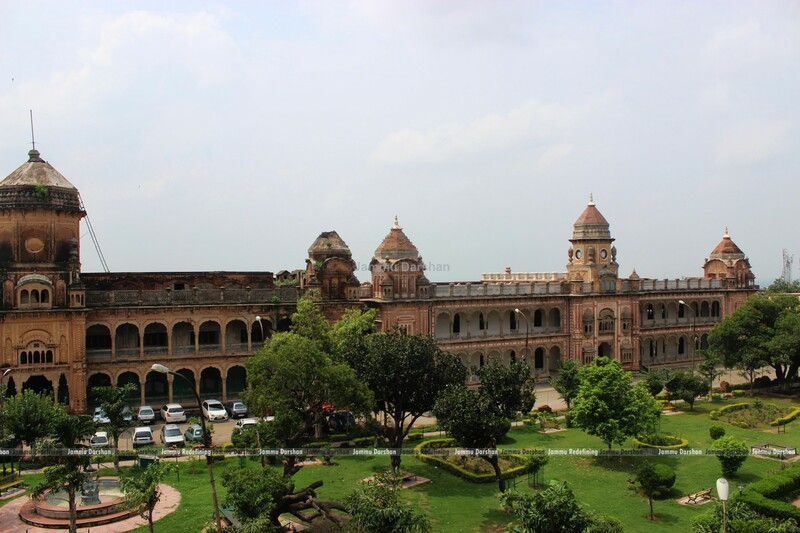 It was a royal residence of Dogra rulers. The palaces are built as a group of buildings around the courtyard. Successive Dogra rulers added to the complex in size. The buildings were used as the residences of the royal Dogra families. The complex has halls and galleries which were used for official functions and public events. is also located on river side, connected with Toshakhana on one side. Is a beautiful palace of red sand stone which stands amidst most picturesque horizons of Jammu. Once the residential palace of Raja Amar Singh, the palace has been converted into a museum and is looked after by Hari-Tara Charitable trust. The museum still has the golden throne on which Maharaja used to sit, which is made up of 120 Kg pure. The museum has a gallery of paintings known as the NALDAMYANT and a library in which about 25,000 books on various subjects and disciplines have been presented. It is presently located in the Pink Hall of Mubarak Mandi Complex. The Museum houses about 800 rare and exuisite paintings from different schools of paintings-viz. Basholi, Jammu and Kangra. Gold painted bow and arrow of Mughal Emperor Shahjehan and a number of carpentary tools also make an important section of the museum. The museum also has hand written manuscripts of Shahnama and Sikandernama both in Persian. Located in the outskirts of Jammu city at a distance of about 8 Kms towards the aerodrome at Satwari. This shrine is very popular among all sections of society. Baba Buddan Shah was borne at Talwandi in Punjab, and it is said that another shrine of this Peer is located at Anandpur Sahib in Punjab. Ziarat baba Roshan Shah Wali An Arabian faquir in 6th century travelled the Asian penninunsula and came to Jammu to settle at the plateau outside the town in a dense forest. The exceptionally large grave built on the slope of Gumat speaks about his lofty personality. In the heart of Jammu city we find a magnificent tomb alongwith a mosque. The Ziarat is popularly known as Peer Mitha. Even the locality around it is named after the Ziarat. The ziarat became popular among the masses as Pir Mitha as he accepted a pinch of sugar among the offerings. This dargah is situated at a little distance from the Maharaja's palace on the Jammu-Srinagar National Highway. The place is as known because of the residence of five peers (holy men), lived here and dedicated themselves to the meditation. This cave shrine of Lord Shiva also known as Jamawant cave is said to be the oldest historic place in the Shivalik region. Located amidst Igneous rocks and acacia jungle in North-East of Jammu city on the side of circular road above Tawi river, the history of the cave is said to be connected with epic-age. Is a temple situated at Sathrian in Roopnagar area of Jammu city. The stone temple has self-made stone Lingam. According to a legend, in the times immemorial this entire place was an uninhabited jungle, the milky cows and buffaloes used to come to the Lingam after grazing and shed entire milk on the Lingam.